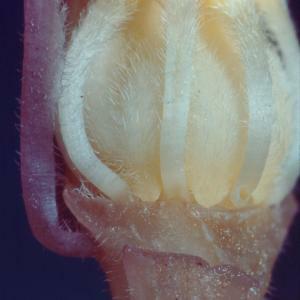 At the base of the flower of Hemitomes (two petals removed), one can see the knoblike nectaries between the hairy white stamen bases. The nectar secreted by these nectaries forms pools in the bases of the petals. A moth might be able to see the light colored flowers of Hemitomes even under relatively dark conditions.